Venice in 24 hours: what to see and how to get around! Venice in 24 hours! Are you planning a quick trip to Venice? Your time is short, but you don’t want to give up on making a pit stop in the most romantic, heartrendingly beautiful city in the world? Let me give you a few helpful tips on how to see the best of Venice in a single day. First, a couple tips about getting around Venice easily as it’s not exactly the most convenient city. If you plan to go by car, keep in mind that Venice is always super crowded and has virtually no streets open to cars. Cars are useless in Venice and you have to leave them in a parking area, always paid. Day rates are far from cheap — starting at €25 for 24 hours — and can be even much spendier. After parking your car, you have to take a vaporetto — water bus — to get to the center, which takes from 15 to 30 minutes. Get on board and soon Venice will appear before you and you’ll immediately be immersed in its magical atmosphere. The train is a good alternative option for getting to Venice. Get off at the Santa Lucia train station and take a vaporetto to the center. If you really can’t do without your car, I’d suggest leaving it in Mestre. The train from Mestre gets you to Santa Lucia in a flash and you can start your 24 hours in Venice. Let’s plan your time well: what to see in Venice in 24 hours. From the vaporetto, you can admire the Grand Canal, Venice’s main waterway. A plethora of gondolas with their gondoliers line the Canal. 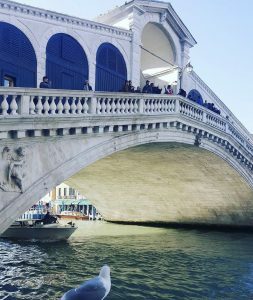 Continue towards the famed Rialto Bridge, one of Venice’s most-photographed bridges. In this part of town, you can visit the Rialto Market, a historic market that has two parts — the Pescheria and the Erbaria — the fish and product market, respectively. Keep going towards San Marco along the streets called Le Mercerie, Venice’s prime streets for luxury shoppers. The classic image of Venice is Piazza San Marco — St. Mark’s Square — with its grand St. Mark’s Basilica, lavishly adorned in Byzantine style. The majestically grand St. Mark’s Cathedral is topped by five domes, the central one of which is 43 meters high. Entry to the Basilica is free and cannot be reserved. Take an elevator to the top of St. Mark’s bell tower, 97 meters high, to enjoy a splendid view of the city. Piazza San Marco is also the site of the Doge’s Palace, the historic seat of Venice’s judiciary, and current site of the Civic Museum of the Doge’s Palace. You can reserve entrance to the Doge’s Palace, which I suggest doing so to avoid needless waits. 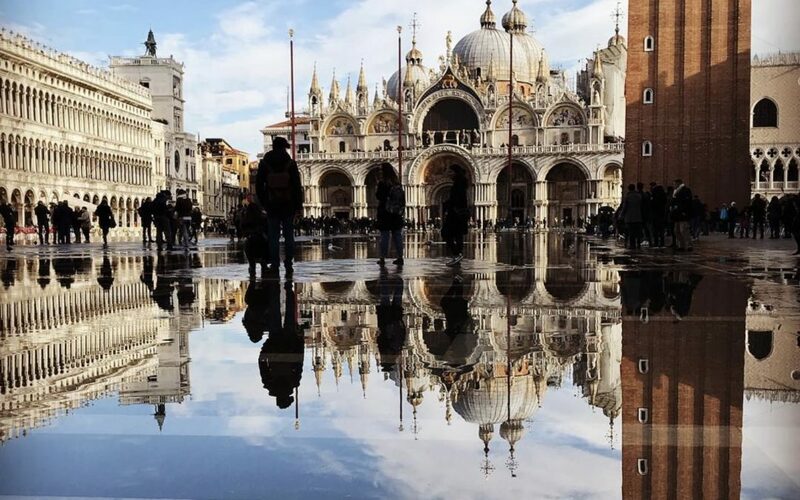 (click here to reserve entrance).The Palace exemplifies sophisticated Venetian architecture; along with St. Mark’s Basilica, it may be Venice’s most distinguishing monument. The Bridge of Sighs From Piazza San Marco, walk towards the Riva degli Schiavoni to admire the iconic Bridge of Sighs, which earned its name as the bridge that led convicted inmates to the prisons of the Serenissima Republic. It was said that the prisoners would let out their final “sigh” in the outside world before their imprisonment. What else should you see in Venice in 24 hours? If your time for Venice is drawing to a close, I suggest choosing one of these destinations, all well worth visiting. Staying in the San Marco area, you might choose a stop at the Clocktower, a remarkably original Renaissance edifice also in Piazza San Marco. The tower’s central section is its oldest, adorned with its famous clock of gold and blue enamel topped by the winged lion, the symbol of Venice. 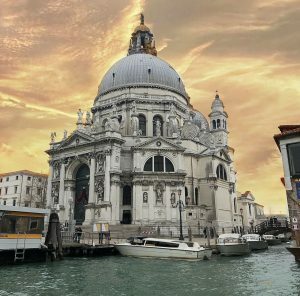 Another option we suggest is visiting the Basilica of Santa Maria della Salute, located on the Punta della Dogana. The Baroque basilica is one-of-a-kind because of its extraordinary location. The church’s entrance almost touches the sea, and the imposing contour of the basilica looms over the lagoon and Grand Canal. If you love modern and contemporary art, you cannot pass up the chance to see the Guggenheim Museum, with its impressive collection of 20th-century European and American art. How about a break to stop for a drink? Café Florian is another spot not to miss on your day in Venice. But I have to warn you that prices are far from cheap. Venetian restaurants are also quite spendy. Venice lives from tourism and prices have come to reflect that. But there are some particularly loved restaurants, frequented by Venetians as well, such as Paradiso Perduto, Osteria e Jazz Club, and Anice Stellato, in the Jewish ghetto along the canal. Though your wallet might take a hit here too. For all you romantic types, why pass up the classic gondola ride? As with everything in Venice, it is quite expensive but truly enchanting. From the gondola you can enjoy a special view of all the ins and outs of Venice’s system of “calle” and canals. If you have a bit of time left over, I suggest heading to the Accademia Gallery to enjoy masterpieces by some of the artists who have most deftly rendered the beauty of Venice on the sea, such as Giorgione, Veronese, Tintoretto, Titian, Giambattista Tiepolo, and 18th-century painters like Canaletto. Visiting Venice is just 24 hours is no small task if you want to savor the city and its lagoon. If you love photography, you can’t forgo the island of Burano, a pearl of the Lagoon: the island of a thousand colors, like no other place in the world. If you want to make this excursion, you’ll have to set aside at least a half day. The island can be reached by water bus. You can take a classic tour of the islands, which lasts about 4 hours. The tour is quite affordable and lets you visit this brilliantly-colored island in addition to Burano and Torcello. If you opt to go to the islands, Burano has a great selection of small restaurants and bars where you can have dinner or just a drink. Our post today was about visiting Venice in 24 hours. The next one about this city on the sea will be about Venice’s top ten most beautiful palaces!